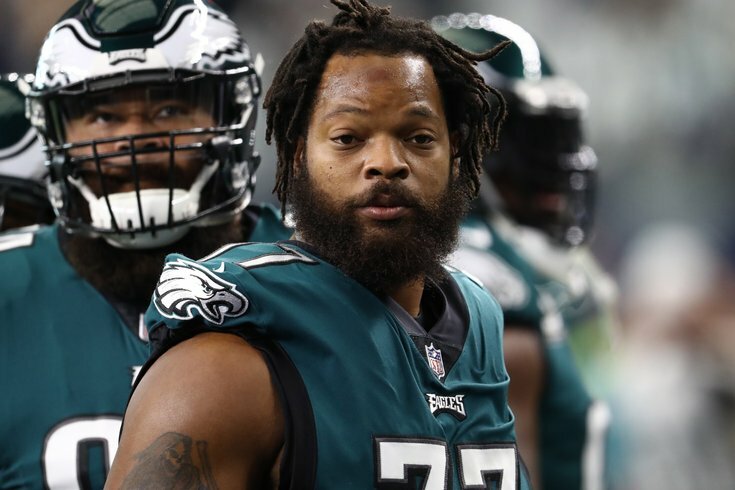 The Michael Bennett trade was more palatable when the thinking was that the Eagles would get significantly younger at DE. And then the team brought back 31-year-old Vinny Curry to replace him. The Philadelphia Eagles entered 2019 free agency with fewer glaring needs than most teams, but certainly in need of some help, particularly at (outside) wide receiver, defensive tackle, and running back. They also had a number of decisions to make on some of their own players, most notably backup quarterback Nick Foles. Jackson remains a premier deep threat in the NFL, as he is still only 32 years old, and has more TD scores of 60+ yards (24 of them) than any player in NFL history. His mere presence should open up the short-to-intermediate passing game for guys like Alshon Jeffery, Zach Ertz, and Dallas Goedert, as well as having a positive effect on the run game. And if the defense cheats up, then Jackson still has the wheels to take the top off the defense, like the Eagles saw for themselves last year in Tampa. Mailbag: Should Eagles have signed WR John Brown instead of DeSean Jackson? • DT Malik Jackson: The Eagles badly needed help at DT, and they found a disruptive player in Jackson, 29, who has 18 sacks over the last three seasons. While $10 million per season is perhaps a tad pricey, Jackson is a player who can make you pay if you try to single-block him on passing downs, and he should get plenty of those opportunities in Philly's defense playing next to Fletcher Cox. In today's NFL, an effective way to slow down some of the high-powered offenses in this league is to create pressure up the middle in the quarterback's face, and the Eagles now have one of the best 1-2 punches at defensive tackle in the NFL. As a bonus, because Jackson was released by Tampa, he will not count toward the compensatory pick formula, so he will not cancel out any players the Eagles lose in free agency. • LB L.J. Fort: Fort, 29, has mostly been a special teamer over his career. He has played in 61 games, with only three starts. He is thought of as a competent sub-package linebacker in coverage. • DE Vinny Curry: Curry will turn 31 in June, and he is coming off a very quiet season in Tampa. When he last played for the Eagles, Curry wasn't much of a pass rushing threat (3 sacks as a 16-game starter), but he was a good run defender. He brings familiarity to the table, but likely not much in the way of impact. The Eagles could have done better here. • S Andrew Sendejo: Sendejo, another old guy at 31, only played in five games in 2018. He suffered a groin injury Week 5 against the Eagles, and was eventually placed on injured reserve, ending his season. In those five games, Sendejo had 21 tackles and one pass breakup. In 2017, Sendejo started on a Vikings team that went to the NFC Championship Game. In 13 games during the regular season, he had 80 tackles, two INTs, and seven pass breakups. In the NFC Championship Game, he got run over by LeGarrette Blount. Sendejo adds some depth to an Eagles defense in need of a third safety behind Malcolm Jenkins and Rodney McLeod. They get a discount on Peters' cap number. (Duh). Peters started all 18 games in 2019, but he missed at least one snap in 11 of them. In total he played about 80 percent of the snaps. Will he be able to stay on the field more being another year removed from his ACL tear, or will his missed time accelerate? That's to be determined. Normally, I would not advocate for a starting left tackle to return to the team at (potentially) $10 million if his ability to finish games was a serious concern. However, the Eagles are uniquely positioned to handle that contingency, seeing as Vaitai now has plenty of experience filling in for Peters on the fly, which is typically not an easy thing to do. Peters is still an above average starting left tackle now making well below average starting left tackle money, and he allows the Eagles to put off finding his long-term successor for one more year. • DE Brandon Graham: Graham is still a very good starter who plays a premium position, especially in the Eagles' defensive scheme, which relies heavily on its defensive linemen to get pressure on the quarterback without the aid of blitzes. Even if Graham hasn't produced sack numbers like the league's elite, he consistently puts pressure on the quarterback, and is outstanding against the run. It is reportedly a three-year deal worth $40 million, which fell well short of some of the other contracts edge rushers attracted in free agency. • C Jason Kelce: There's a strong argument to be made that Kelce is the best center in the NFL, and the Eagles rewarded him as such, signing him to a one-year contract extension that will keep him under contract through the 2021 season. A report emerged this offseason that Kelce was mulling retirement, a notion that Kelce himself acknowledged. This contract extension ends the possibility of Kelce retiring this offseason. The fact the he is now also the highest paid player in the league at his position should quell concerns that retirement is happening anytime soon. There's a pretty good bet the threat of Kelce retiring led to this raise, by the way. • WR Nelson Agholor: The Eagles had something of a deadline on March 13th, when Agholor's 2019 salary became fully guaranteed. The Eagles would have preferred to trade Agholor for some sort of value, but they ended up just keeping him at $9,387,000. Agholor is not worth $9,387,000, however, with Alshon Jeffery and DeSean Jackson starting on the outside, Agholor can return to his best position in the slot. The Eagles will have a really good trio of receivers that would give the offensive staff all kinds of different ways to attack opposing defenses. They'd have a potent 11 personnel grouping, to go along with a two-tight end package with Zach Ertz and Dallas Goedert. Doug Pederson could get really creative cycling back and forth between those two groupings, mixing run and pass, and keeping opposing defenses off balance. • CB Ronald Darby: Darby was no doubt hoping for a long-term lucrative deal, but teams were obviously scared off by his torn ACL last season. Instead, he'll return to Philly on a one-year "prove it" deal. On the one hand, he just turned 25 in January, he has good coverage skills, and he's probably the most athletically gifted of the Eagles' corners. On the other hand, he doesn't exactly embrace the art of tackling, he's coming off a serious injury, and the Eagles are already loaded up with young depth at the position. Still if there's a position where it's ideal to have an overabundance of depth, it's at corner, as the Eagles saw last season. To be determined if the Darby signing will be a precursor to a trade of one of the corners already on the roster. • OG/C Isaac Seumalo: The team values Seumalo's versatility, length, athleticism, and intelligence. He started 11 games for the Eagles in 2018, including two playoff games. It's a team-friendly three-year contract extension that will keep Seumalo under the team's control through the 2022 season. • S Rodney McLeod: McLeod was scheduled to count for $9,906,250 against the salary cap in 2019, $5,093,750 of which the Eagles would have saved if they traded or released him. After the restructure, he is now on a one-year contract, but will count for $8 million against the Eagles' cap, spread out over 2019 (for $4,843,750) and 2020 (for $3,156,250). McLeod showed how valuable he was to the team after he was was gone, as the Eagles' safety play dipped significantly after he was lost for the 2018 season. However, with hindsight being 20-20, there's an argument to be made that the Eagles made a mistake in bringing McLeod back at $8 million, seeing as a large number of safeties have since flooded the open market, and the Eagles could have capitalized by potentially finding a "good enough" player for not a lot of money. • QB Nate Sudfeld: The Eagles placed a second-round restricted free agent tender on Sudfeld. That was a no-brainer, for all the reasons noted here. • K Jake Elliott and LS Rick Lovato: Elliott and Lovato both have fewer than three accrued seasons in the NFL, which made them ERFAs (exclusive rights free agents). Elliott will count for $645,000 on the Eagles cap in 2019, while Lovato will count for $720,000. Assuming Elliott and Lovato both earn accrued seasons in 2019, they will be RFAs (restricted free agents) in 2020. • QB Nick Foles: When the Eagles opted not to franchise tag him after a solid market didn't develop for his services, Foles was free to walk in free agency. A trade of Foles was always unlikely, and the decision not to tag him absent a deal in hand was always the obvious one, despite other reporting to the contrary. Because he was not released, and his contract simply ran out, Foles will count toward the compensatory pick formula, and the size of his contract will unquestionably count at the highest comp pick level, in the third round. The two defensive end starters to begin the 2018 season were Brandon Graham and Derek Barnett. Graham unexpectedly signed a contract extension before testing the free agent waters, and it is expected that Barnett will resume his role as a starter next season when he returns from a torn rotator cuff. That left Bennett potentially as a $7.2 million rotational defensive lineman, up from $5,650,000 a season ago. By trading Bennett, they saved that $7.2 million in full. While the compensation in return wasn't much, a trade of Bennett makes sense, seeing as (a) the Eagles could stand to get younger at defensive end, and (b) Howie Roseman called this defensive line draft class "historic" back in January. It also frees up extra money for the Eagles to use in free agency. And then they signed 31-year-old Vinny Curry. Oof. As such, I would like to amend my above take. Part of the reason Bennett was traded was because his personality clashed with some in the organization, I'm told, and apparently he graded out poorly against the run. On the "personality" point, I didn't always like everyone I've ever worked with. But so what? If that employee is producing, deal with it. As far as on-field production, which would you rather have? A defensive end who gets to the quarterback but is less than awesome against the run? A defensive end who's a good run defender, but doesn't often affect the quarterback? Give me No. 1 all day, even if it costs more. • LB Jordan Hicks: The Cardinals signed Hicks to a four-year, $36 million deal. That's a hefty price for an often-injured linebacker with no interceptions and no forced fumbles since 2016, but the Cardinals are obviously hoping they are getting the player he was earlier in his career. The Eagles were absolutely right not to match that price, however, the loss of Hicks will leave them with a hole at linebacker. • WR Golden Tate: The third-round pick the Eagles traded to the Lions for Tate remains a bad use of resources. However, the Giants bailed the Eagles out to some degree when they signed Tate to a four-deal worth $37.5 million, or $9,375,000 per year. As a result, at least the Eagles will likely get a fourth-round compensatory pick in return. • WR Jordan Matthews: Matthews signed with the Eagles during the season in 2018, and was a reasonably productive player when he got opportunities, at least in terms of expectations. He finished the season with 20 catches for 300 yards (15.0 YPC), and 2 TDs. He also caught a 37-yard touchdown pass in the playoffs against the Saints. Both Tate and Matthews had little chance of returning to the team after they traded for DeSean Jackson and opted to keep Nelson Agholor on his fifth-year option. He'll count toward the comp pick formula. • S Chris Maragos: Maragos was a team captain, who was at one time one of the best special teams players in the NFL. He was also a well-respected player in the Eagles' locker room, and a favorite of the coaching staff. He suffered a serious injury against the Panthers in 2017, had surgery, and then required a second surgery near the end of the 2018 season. Maragos' (little-known) greatest strength was his speed, as he was one of the fastest players on the team. With his speed unlikely to fully return after two knee surgeries, his career may be over. • DT Haloti Ngata: Ngata had a great, long career, but he was cooked. Ngata played in 13 games last year for the Eagles, starting nine. He had 17 tackles and a sack. • OG/C Stefen Wisniewski: The Eagles opted not to pick up a $3,708,334 option on Wisniewski for 2019. They'll have more money to spend in free agency, but they will also need to replace Wisniewski, who was a quality interior offensive line backup, capable of starting when needed. • RB Jay Ajayi: Ajayi reportedly visited with the Colts earlier this week, and was apparently scheduled to take a physical. He left without signing a contract. The Eagles probably would have preferred that he signed for a comp pick-qualifying contract. • DT Timmy Jernigan: Earlier this offseason, the Eagles made the obvious decision not to exercise a 2019 option on Jernigan, a 300-pound man coming off back surgery. Jernigan's back has undoubtedly scared teams off. If Jernigan doesn't find any interest around the league, it would make sense for the Eagles to bring him back on a very cheap "prove it" deal. As a rotational guy who plays 15 or so snaps per game, he could be a disruptive player. The Eagles would just have to be careful relying on too many injury-risk players, seeing as injuries were ultimately too much to overcome a season ago. What didn't they do yet? I was certain the Eagles were going to add a running back in free agency, but so far, nothing. Of course, that doesn't mean that they won't. And really, at this point, with a dearth of teams around the league needing running back help, the Eagles may as well just wait around for a while for prices to come down, and then sign a back on the cheap. Free agents like T.J. Yeldon and Spencer Ware are still available, as are guys on the trading block like Duke Johnson and Jordan Howard. Surely, they're not just going to rely on the guys already on the roster, right? I mean... right? The "Jackson Two" could be impact players in 2019. They got the Eagles' free agency period off to a fast start. Retaining some of the veteran leaders has been underrated, in my view. Kelce is the best center in the NFL, and the deal he signed should stave off his retirement for a few years. Additionally, I've seen some say that Graham got overpaid. I don't see it that way. He got under-market value, in my opinion, and somehow he remains a better player than he's given credit for. I even think that Peters, at 87 years old, could rebound after a down year, a year removed from his ACL rehab. The Seumalo signing was low-key a great contract, from the Eagles' perspective. Free agent offensive linemen have made bank the last couple years, and the Eagles got a starter on the rise (or at a minimum, a valuable, versatile backup) to take below-market pay just before his contract year. Trading Bennett and replacing him with Curry is a clear downgrade on the field. I'll take the comp picks over Sendejo and Fort. Losing Foles and Hicks could hurt, but there was no way the team was going to retain either player at their new salaries.